The Croa community’s land is located a few hours’ drive and a short boat ride from Cruzeiro do Sul. A small city, Cruzeiro do Sul is a major center for the western part of Acre and the region around the Jurua River. There are daily flights from Rio Branco, and the town is accessible by road from Rio Branco six months of the year and by the Jurua River throughout the year. From Cruzeiro do Sul it takes two to three weeks to travel by boat to Manaus. In short, the Croa community is nestled in the western corner of Brazil’s Amazonian forest and, from the perspective of São Paulo, seems a remote and isolated place—something that, in our world of excessive connectivity, is considered a negative. But from the perspective of the people who live there, relative isolation can be a bonus. The communities I saw, including the Croa community, draw strength from their cultural identity and a sustainable economy. Not all these communities are strong, but they understand clearly that both these conditions are necessary if they are to thrive. The communities are well connected among themselves and, beyond Acre, with the world—strangely enough, many of the things that concern them are, in fact, more closely related to world issues than to specifically Brazilian ones. Left: Ashanika Indian, Acre. Photo by Mauro Almeida. Right: Marjetica Potrč, Drawing No.1/7: Pattern Protects, 2007, 7 drawings. Courtesy the artist and Galerie Nordenhake, Berlin. When such communities reach out to others, they want to do it on their own terms. They want to interact in a positive way with others and at the same time remain separate. By reaffirming their own territories, they are actively participating in the creation of twenty-first-century models of coexistence, where the melting pot of global cities is balanced by centers where people voluntarily segregate themselves. After all, one of the most successful and sought-after models of living together today is the gated community—the small-scale residential entity. But unlike gated communities, which represent static strategies of retreat and self-enclosure, the new territories in Acre are dynamic and proactive: they reach out to others. 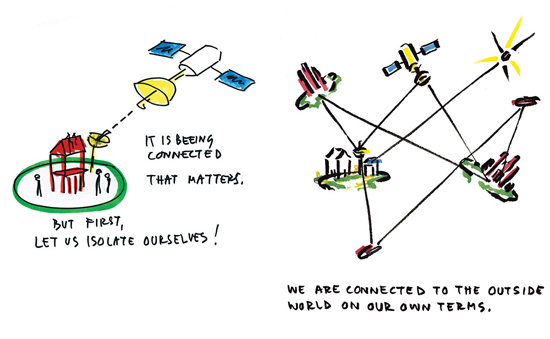 Isolation and Connectivity, Left: Marjetica Potrč, drawing for project The Struggle for Spatial Justice (A luta por justiça espacial) for 27a. Bienal de São Paulo. Right: Marjetica Potrč, Drawing No.5/12, Florestania, 2006, 12 drawings. Courtesy the artist and Max Protetch Gallery, New York. Statement #1: The world must be pixelized! Democracy is particles! Over the past two decades, Acre has been pixelizing itself into new territories, such as extraction reserves and Indian territories, along with sustainable urban territories. The government supports the territorialization of the state. These new territories are the result of collaboration between the government and local communities. The communities are self-organized entities and, basically, bottom-up initiatives. Their focus is on empowering their own people (education is a primary concern); practicing the sustainable extraction of forest-based resources; and developing a small-scale economy as both a tool for their communities’ survival (several communities have been successfully selling their goods on the global market) and as a counter-model to the globalized economy created by multinational companies and organizations. The Acrean communities have a particular approach to land ownership. In the new territories, the emphasis is not on the individual owning land and extracting resources from it solely for his own benefit, but on the collective ownership and sustainable management of natural resources for the benefit of the whole community. Here, the existence of an individual is understood essentially as coexistence. Being always means “being with,” and “I” does not take precedence over “we.”1 In short, the new territories suggest forms of living together that go beyond neoliberalism and its understanding of individualism, liberal democracy, and market capitalism. Notice that the new territories of Acre represent a social and economic alternative to China’s new territories, which are characterized by fast-growing, large-scale economies and an ideology of progress. The territories of Acre, by contrast, are grounded in a small-scale economy; the people who live there feel a personal responsibility both toward their own communities and toward the world community. In fact, in their dynamics of deregulation and strategies of transition, Acre’s new territories suggest a different comparison: with the European Union as it is today. As a geopolitical entity, Europe is constantly expanding. It is a body in flux. Within its shifting boundaries, the consequences of the gradual dissolution of the social state and the ideology of multiculturalism can be seen in territories consolidated around ethnic groups and other kinds of communities. As last year’s rejection of the EU constitution by French and Dutch voters indicates, people want to live in a more localized European Union; similarly, the EU explores a paradigm in which regional entities serve as a counterbalance to the nation-state. An emphasis on the local means that more decisions are taken at the local level and bottom-up initiatives are on the increase. The state of “transition” is accepted as a working model, and there is a civil society in the making that is quite different not only from the society of twentieth-century modernism, which feared any threat to unity, but also from the present-day ideology of globalization. As regionalism and localism gain ground, new models of coexistence emerge, such as urban villages and urban villas, new typologies of residential architecture. In the heyday of the modernist national state, a residential community could mean some ten thousand people. Today, an urban village means two thousand people—a dramatic shrinkage from the earlier model. Another important distinction is that today’s urban villages are, again, bottom-up initiatives, while the modernist residential community was organized from the top down. The question is: just how far is it possible to “downscale” the world community? The territories in Acre are the result of “degrowth,” the process by which society fragments and pixelizes itself down to the level of the local community, and sometimes even further, to the level of the individual.2 Age-old wisdom tells us that when individuals take responsibility for building their own lives, they also build their communities, and beyond that, the world community: “When I build my life, I build the world.” As the Acrean territories show, communities see the consequences of such practices very clearly: they see “upscaling”—the scaling down of the economy and the pixelation of territories produce a new kind of connectedness: “upgrowth.” In Acre, particles and group identities are forces of democracy. Statement #2: We must grow up strong together! A precondition for communities in the new territories to thrive is that they draw strength from a sustainable economy, local experience—a loose notion that embraces the importance of cultural identity—and education. The communities believe that territories which are strong in these areas have the best chance to prosper. Although the emphasis is clearly on the local (they see rural communities as guaranteeing greater dignity, in contrast to the kind of life migrants to urban centers experience), they do not romanticize localness. They see themselves as players in the contemporary world: they had to overcome both the colonial past and the dominant globalizing pressures of the present. Theirs is a post-colonial, post-neoliberal practice. From where they stand, they see the future as their present. Universidade da Floresta (University of the Forest), Acre. Left: video still by Garret Linn, in Marjetica Potrč, Florestania: A New Citizenship, video, 2006. Courtesy the artist and Max Protetch Gallery, New York. Right: Marjetica Potrč, drawing for project The Struggle for Spatial Justice (A luta por justiça espacial) for 27a. Bienal de São Paulo. Practice #1: We are growing up together strong; we are connected! But first, let’s isolate ourselves. Only then we will be able to connect on our own terms. The new territories of Acre are, indeed, strong and well aware of the benefits that come from being connected. Clearly, local emphasis, self-esteem, and connectedness make a perfect match, not a contradiction. I am thinking in particular of an ongoing initiative by Indian tribes to connect their remote areas via satellite through solar-powered communication centers. Representatives from the tribes are traveling all the time—at least this was the impression I received from encountering them on the streets of Rio Branco and at airports, or, for that matter, not seeing them because they were in São Paulo while I was in Rio Branco, or in Rio Branco when I was in Cruzeiro do Sul. Indeed, I had the feeling that they traveled more than Paulistas. An Acrean can with justice say to a Paulista: “I know you, but you don’t know me.” The general feeling one gets in São Paulo is that Acre is very far away, an unknown, isolated region, not well connected at all. This perspective of the center toward the periphery is overturned in Acre, where territories are understood as centers that want to connect on their own terms. Acreans don’t see themselves as being too isolated. They like their degree of isolation. They draw on the wisdom of the forest: the “center” is a place in the forest where the “game”—the chance to make a good life for oneself thanks to the proximity of natural resources and community infrastructure—is strong and multiple connections to the outside world are not necessarily a bonus; the “periphery,” meanwhile, is along the river, where a person may be more connected to the world outside but the “game” is not so strong. As always—and as common wisdom tells us—the center is what’s most important. School Bus, Croa Community, Acre. Left: video still by Garret Linn, in Marjetica Potrč, Florestania: A New Citizenship, video, 2006. Courtesy the artist and Max Protetch Gallery, New York. Right: Marjetica Potrč, drawing for project The Struggle for Spatial Justice (A luta por justiça espacial) for 27a. Bienal de São Paulo. Practice #2: We marry local experience with hi-tech knowledge! The new territories of Acre are strong “centers” with rich local experience; they balance connectedness and isolation well. In a way, these territories are perfect islands: you can reach anyone from here but not everyone can reach you. The next most important thing is their practice of self-sustainable management—the result of blending local experience and hi-tech knowledge. Hi-tech sustainable solutions help them upgrade their living conditions, and allow them to communicate and trade from remote locations with little or no energy infrastructure. Advanced technology (such as solar-powered satellite dishes) means that at last, in the twenty-first century, the remote territories of Acre can themselves become centers, no less than other places, by using self-generated energy, which in turn gives them greater freedom in communicating. Without a doubt, the combination of local experience (from the territories) with hi-tech knowledge (from Brazil) is potentially a geopolitical advantage. But can it really work without the support of the state? Practice #3: Happiness is: growing in small steps! Ours is a dignified life! We are accountable for ourselves and to others! Those who manage the sustainable extraction of forest-based resources see the small-scale economy both as a tool for their own survival as well as a new economic model that is necessary for the survival of the planet and society at large. In Acre, clichés acquire real meaning: “The survival of the rain forest is the survival of the earth; the rain forest is the final frontier; the world is one community.” It feels as if Acre’s government and its people are on a mission. Does the future of the world depend on locally managed territories and small-scale economies providing a balance to the globalizing forces of multinational companies and organizations? The people I spoke with in Acre are convinced of this. But there’s a Catch-22, an obvious contradiction that resides in the very notion of sustainability. While any nonsustainable extraction of forest resources would have dire consequences not only to these communities but also to the entire world, efforts to achieve self-sustainable management of the forest through a small-scale economy present important challenges. Can the territories really survive and even thrive on this? Apart from natural resources, how well does local knowledge trade on the global market? Practice #4: We protect what belongs to us! Cupuaçu is ours! The new territories of Acre are strong centers and well connected; they practice self-sustainability and self-protection. The protection of the new territories is a must, not only because of the long history of their cultures being abused—which means self-protection comes naturally to those who live here—but also because of the ongoing threat of bio-piracy. The unlawful theft of natural resources in a region whose greatest wealth is biodiversity ranges from famous incidents involving the theft of rubber tree seeds (which led to the collapse of the region’s rubber extraction economy), to recent cases of a Japanese company, among others, attempting to patent the indigenous fruit known as cupuaçu (the Japanese patent has recently been revoked). So it’s no surprise, really, that Acre’s efforts to protect the territories from outsiders may seem excessive. The remoteness of their location does not guarantee sufficient protection for the Indian territories. If visitors to an extraction reserve are viewed with healthy suspicion because of fears that they might be involved with bio-piracy, a visit to an Indian tribe is extremely difficult to arrange. The main reason for this is to shield indigenous cultures. In theory, all would-be visitors to an Indian tribe must state their reasons for wanting to travel there, and visits must then be approved by the community. In this way, the territories remind us of the fortified city-states of Renaissance Italy or today’s contested territories in the West Bank. Indeed, the Acrean practice of planting trees as border protection in defense of one’s territory mirrors practices by Palestinians and Jewish settlers before the erection of the Israeli Barrier Wall halted negotiations between the two communities. A major difference, however, is that, while the Acrean territories may recall walled cities, they are not closed off. Today, the borders of these fragile and contested territories are porous. They permit and even welcome negotiations. And as for any precise demarcation of these territories’ borders, this remains in flux for the simple reason that rivers change their course and villages relocate themselves in the search for natural resources. And here is a contradiction: these strong territories are in fact fragile territories. To be able to exist and prosper, they need to be constantly communicating with the world and negotiating with their neighbors. Practice #5: We are not objects of study! We want to share our knowledge on equal terms! In a horizontal world, education must be horizontal! To each group, their own education! We are unique! Education—learning and sharing knowledge—is a crucial issue for the new territories, but the same may be said for the whole of Brazil and beyond. We have learned that the riches of education, though seemingly immaterial, are what guarantee the material wealth of nations. Today, the richest countries are those with the strongest educational systems. This awareness is even more important in the context of Brazil, ranked first in the world in the gap between rich and poor—which also means there is an immense gap where education is concerned. The new territories of Acre, although wealthy in both natural and intellectual resources, cannot hope to provide the kind of high-quality education the rich world demands. But being so inventive, the people of Acre organize things differently. The goal is to customize education for particular groups in the community. Established hierarchies are put in question, and education is organized in a way that makes sense for the community. 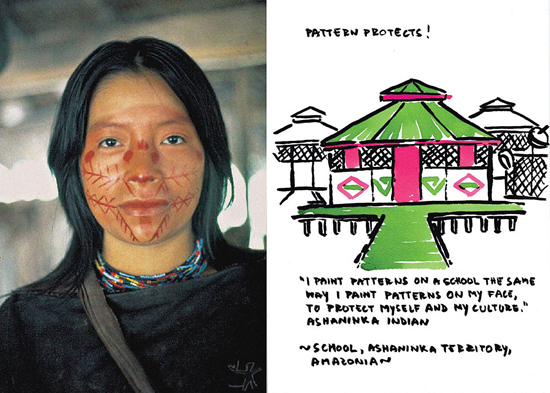 Schools and local knowledge are cherished and protected—just as the territories themselves are. It struck me that the demands that shape education are, in a way, similar to those that shape the territories. Both exist for their people and both are necessary for people’s prosperity and aspirations, framing the life of the community. Two collaborations are under way in Acre that I find especially inspiring. One involves the building of schools in remote areas for primary education; this is a collaboration between the local communities and the government. A typical school of this sort is equipped with extensive solar paneling and a satellite dish—in other words, an energy supply and a means of communication with the world. The second collaboration concerns higher education. This is the University of the Forest, whose goal is to bring together the knowledge of rubber-tappers, Indians, academics, and scientists so as to marry local experience with Western science. This makes sense. Brazil, after all, is a hi-tech country where the knowledge of those who live in the forest is not taught in the classroom but experienced directly. Indians and rubber-tappers, the caretakers of the forest, don’t want to be objects of research. They want to contribute to our shared knowledge on an equal basis. They want to trade their knowledge as they see fit. I see the University of the Forest as a new and important model for higher education. Statement #3: The people of the ’60s were thinkers; we are doers! My aim in writing this was to make sense of what I experienced during my stay in Acre in March and April 2006. I know that my assessment of the situation is far from thorough, but so be it. For me, it all comes down to the question: “What does it mean to live a dignified and responsible life today?” I realize that the community structures in Acre are not intended as models for other communities. The things I have mentioned here are simply their practice—the practice of sustainable existence. For me, their strategies recall other twenty-first-century experiences, such as the new states of the Western Balkans, which were formed when the region collapsed in the wars in the 1990s; like Acre, this region, too, has become pixelized into small territories—territories that are rejuvenating themselves by implementing practices and pursuing aspirations similar to those of the people of Acre. In both cases, downscaling is producing a scaling up: these particles and group identities are not static and self-enclosed, but dynamic and open to the world. I believe that faster and slower worlds can exist simultaneously in parallel realities, and the Western Balkans and Acre seem to me to be fast worlds, in some ways ahead of the rest. So it’s possible for us to learn from their practices. I loved what I saw in Acre. It would be nice to think that the proposals of Constant and Yona Friedman, as well as other thinkers of the 1960s, such as Hélio Oiticica and Lygia Clark, who dreamed of a world community, provided inspiration for the people who are today forging Acre’s new territories, but I know that the Acreans have very likely never heard of them. Still, it’s beautiful to see that the doers of today are materializing the ideas of the thinkers of the ’60s. I thought it was fantastic how everyone we talked with in Acre saw clearly the benefits of their practices, for both themselves and the world community, and understood how to implement them. The new Acrean territories make me hopeful for our future coexistence. Their success is evidence that humanity can function as an intelligent organism. As it reaches critical mass, the world community, combined with a free-market economy, is generating alternative approaches to today’s neoliberalism, whether this means an emphasis on small-scale economies or a society based on local communities. Most importantly, those who live in the Acrean territories understand themselves as particles in, and contributors to, the world community. Rural School “Luiz Placido Fernandes,” Acre. Left: Courtesy of Seplands and Prodeem, the State of Acre, Brazil. Right: Marjetica Potrč, drawing for project The Struggle for Spatial Justice (A luta por justiça espacial) for 27a. Bienal de São Paulo. For sharing their vision and experience, I am particularly grateful to Camila Sposati, who provided me with a superb introduction to Acre and its people, to Sergio de Carvalho e Souza, who was an incredible guide for understanding the new territories, to members of the Croa community (Gean Carlos de Oliveira and Silvana Rossi), to representatives of the Indians (Luiz Waldenir Silva de Souza and Mutsa Katukina), the extraction reserves, and the government (Chico Genu and Marcus Vinicius), as well as to Manuela Carneiro da Cunha, co-author of the Enciclopédia da Floresta and a key figure in the University of the Forest, and many others besides.